If you – like me – have watched the anime “The Rose of Versailles” (Berusaiyu no Bara or short: BeruBara) as a child, I don’t need to explain any further, but for those who haven’t, it is a very popular manga written by Ryoko Ikeda in the early 1970s. Maybe you’re more familiar with “Lady Oscar” the main character, who despite being born a girl is raised as a boy to fulfill the wish of her father, a general, for a successor. Although it is a fictive story it takes place in France around the time of the French Revolution and parts of the storyline are based on historical events and characters. I really loved the anime when I was in elementary school – in fact, I still do and I can still sing the German intro. You can imagine how excited I was when I heard that the Takarazuka Revue is going to play The Rose of Versailles – again, I have to say. Because The Rose of Versailles is actually the most famous play of the Takarazuka Revue and played a crucial role in reviving the musical after television became its enemy. As explained in the documentary below (in Japanese), when TVs spread and the stars could be watched at home, very few people went to see Takarazuka shows. The Revue faced a crisis when one of its fans suggested to turn The Rose of Versailles, the most popular manga at the time, into a play. But this wasn’t as easy as imagined. The actresses struggled with the problem of how to turn the poses from the manga into movements on stage. 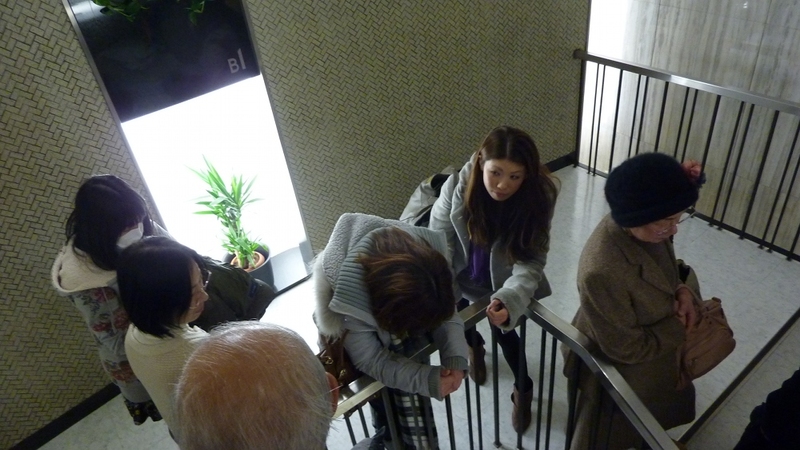 They managed to overcome this problem with the help of Hasegawa Kazuo, a famous actor in film and theatre. He was familiar with playing both male and female roles and used his experience to translate The Rose of Versailles into the musical we know today. For example, he told the actress playing Oscar where to stand by using what is called the “golden position” in Kabuki theatre. He also told her where to look to make use of the lighting and let her eyes sparkle just like it is drawn in the manga. The play was a great success. But there was one storyline in the manga, which hadn’t been included in the musical: The love of André for Oscar. Because of the positive reactions to the first play, it was decided to bring The Rose of Versailles to the stage a second time, but this time the story of André and Oscar would be more important than the story of the French Revolution. Hasegawa again helped to realize the play and created the famous scene between André and Oscar. The second play was even more successful than the first and led to the so-called “BeruBara-Boom” which revived the Takarazuka Review. Ever since, The Rose of Versailles has been played by different troupes and in different versions every few years and never lost its popularity. I’ve seen a few plays at the Takarazuka Review during the last years, but I was always waiting for a chance to watch BeruBara and this year the chance had finally come. I knew that tickets would be hard to get and so I started hunting as soon as the advance sale started. Not even a really bad cold could stop me from that 😀 It took half an hour of constantly reloading the Revue’s website until I had my tickets, but it was totally worth it. The play was as epic as I imagined. It was also as kitschy as it could get. Especially the last scene which was hilarious, but I won’t spoil you here. If you ever have the chance to watch this play don’t miss it! The stage minutes before the beginning. Many people were standing as well. I really liked Aida’s critical stance and the irony with which he depicts severe problems, although there are also some harder digestible works like his “DOG”-series. This series and other works were displayed in a separate room marked as being suitable for 18 years old or older, but I didn’t really understand the rating policy behind this. For example, what’s the difference between “Blender” in which young girls turn into a bloody juice and the “Mimi-chan”-series, which shows several ways how to eat “edible artificial girls”? Personally, I found the former more disturbing than the latter, but the “Mimi-chan”-series was kept in the 18+ room while “Blender” was not. Why?? I thought the “Mimi-chan”-series were a wonderfully ironic way to criticize how we take eating fish and meat for granted, always forgetting that those we’re living creatures, too. Imagine, someone would invent an artificial creature that offers meat, but happens to look like a young girl. Would it matter? Would we stop eating fish if it looked like girls? Where do we draw the line and why? Well, I don’t know much about art and I just wanted to share my main impressions on this visit so I will stop here. You can find a much more detailed (and longer) article on Aida Makoto and his work here. But be warned of shocking images. Would you’ve thought that there will be a third part to this story? Me neither, but here it is! I moved again. The third time in less than 1.5 years and I hope this time I’m gonna stay a little bit longer. Preferably, until I finish studying at Handai, but I’m confident about that because I found a place that fits perfect to my wishes. In fact, it fits almost too perfect so I really really hope there won’t be any surprises later (I got a little bit doubtfully as you might understand if you’ve read part I and part II of this tiny series). Then my boyfriend decided to go to Germany in October to study German and I started to think more seriously about moving. “If he goes to Germany for a while, I could look for a smaller and cheaper apartment. Maybe something nearer to university. And with more sunlight for my desk.” The last point was crucial for me because my desk was placed at the darkest part of the apartment so I had to turn on the lights even during the day to work there. But that was against my electricity saving principles, so I ended up working on the sofa all the time which lead to back pain………………. Anyways, I started to check for free apartments more frequently, thinking that if there was a nice one I could move, but if not that would be fine, too. I didn’t have to move immediately, so I could wait for the right chance. There were a few apartments which weren’t too bad and I went to see a couple of them but in the end, I decided against moving. Since those were all single apartments I wouldn’t have been able to move before October and I didn’t want to make a contract for an apartment which didn’t fit 100% too early. In most cases making a contract that early wasn’t possible anyways. Then I found the apartment I finally moved into. A rather old building from the 70s, but very clean and nice. There were lots of pictures which looked like the apartment would be very bright, too. Actually, it was even bigger, but cheaper than my old apartment, so I showed it to my boyfriend who liked it as well. If we would be able to move together we could move before he leaves for Germany, so I called the agent for this apartment. The apartment was still available and I made an appointment to see it on the same day. After my call to the agent my boyfriend asked me whether it was allowed to move in together and I said that there was nothing written about this but since it was such a big apartment, I was sure that it was possible. But he insisted on asking about it before we would see the apartment. After all that happened last year, he was right, so I called the agent again. And got a shocking answer: The landlords don’t allow two persons to move in because it’s an old building and the neighbours would be disturbed. I was really disappointed to hear that. I thought about it for a while and then called the agent a third time. If we couldn’t move in together, I could still try to make a contract for October and move on my own. So I went to see the apartment alone. The pictures on the website weren’t promising too much. My first impression was very positive. Old, but well-maintained, bright and spacious. I imagined how my furniture would fit in figured that my desk could get a nice place in front of a window so I would have as much sunlight as possible. 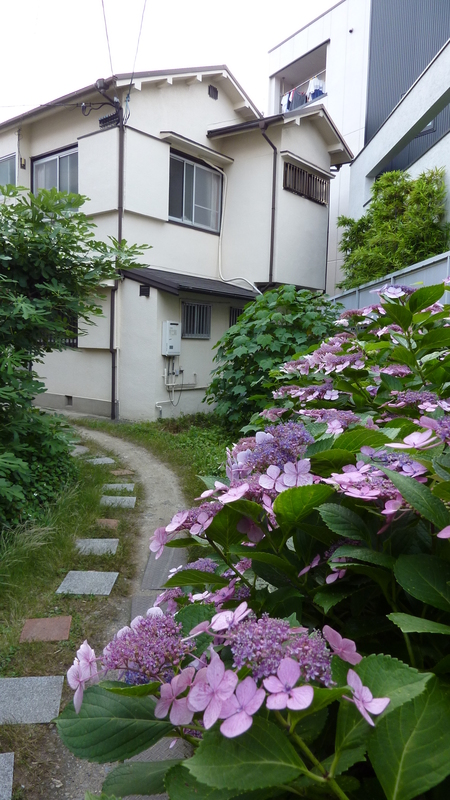 I also liked the garden in front of the house and the kitchen that actually deserved to be called a kitchen. There was enough space for a 2-burner gas stove, which is really hard to find in small apartments, and some space to prepare food next to it. Did I mention it was almost next to Handai? I fell in love with this apartment. Talking to the agent, I told him about my situation and that I could move immediately if it was possible to move together with my boyfriend, so he said he would talk to the landlords. I didn’t expect that they would make a compromise but it wouldn’t hurt to try so I waited for his call. The call came and the result was positive! The landlords would accept the two of us if it was only until October. I was very excited about these news but wanted to talk to my boyfriend first. After I got his OK, I called the agent again and made another appointment to see the apartment together with my boyfriend. When we got there, I asked about the landlords’ reaction. The agent said he asked the landlords if it would be alright if someone staid over night very often until October, which they didn’t mind. But that was not what we were asking for, because like this we would end up just like in the first apartment and would have nothing to say if the landlords would find out that my boyfriend actually lived together with me instead of just sleeping over. He had to be in the contract. So the agent said he would talk to the landlords again and make the situation clear. I doubted that they would agree with this but waited for their decision. And the result was positive again! Now there was nothing left that would keep us from moving and after I got a last OK from my boyfriend I called the agent to prepare the contract. I don’t know how many calls I had to make for this apartment in the end, but I’m really glad everything worked out fine and I am happy to be here. This semester started off with a nice surprise. I was about to get some spinach omrice because that’s the only menu at “Sora” cafeteria which doesn’t drive up your energy consumption by 900-1000 kcal like the others and is a tiny bit more healthful than a plain omrice. But when I entered the cafeteria, there was a table and pinboard next to the usual menu display. A poster indicated that this was a campaign by Tanita, so I stepped closer to the table to find out that the cafeteria offers a Tanita set menu which changes weekly. 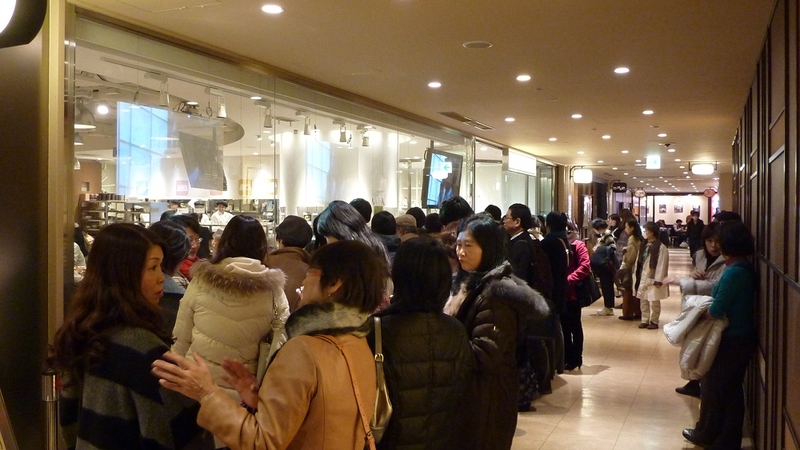 Tanita had opened its first restaurant in Tokyo in January this year and it was overrun during the first weeks. (Does anybody know the current situation?) Compared to the restaurant where the weekly set menu costs 900 Yen, the set menu at Osaka University is only 500 Yen which is among the highest prices for menus at the cafeteria but still almost half the original price. There’s even a body fat scale and I’ve seen a few people actually using it. Of course I had to try the Tanita set menu and it was very tasty. In fact it had much more taste than the one I tried in Tokyo. 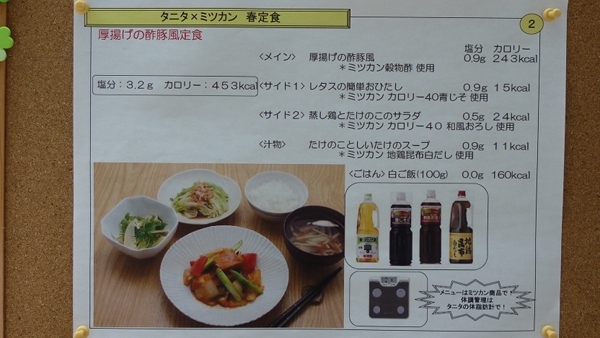 The information on the pinboard says that the menu follows the same principles as the famous cooking books, which are 1) around 500 kcal per set menu, 2) spare use of salt, 3) reduced amount of fat and 4) being filling. But if you read the information on the pinboard closely, you’ll find that Tanita isn’t working alone here. There’s another company cooperating: Mizkan, which produces many basics for Japanese cooking like Mirin, vinegar and various kinds of broth. 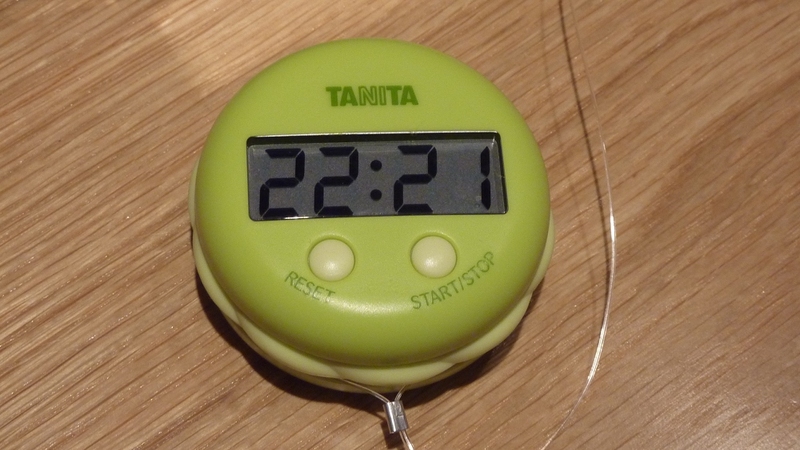 Anyways, Tanita seems to stay a part of my research and if Tanita continues to publish books with this speed I’ll be broke in no time… Oh, and if somebody knows about other campaigns, cafeterias featuring Tanita products and/or menus I’d be gratefull to hear about it! If there was a list for endangered blogs, this one would be on it for sure. It’s getting harder and harder for me to find some spare time to type a few words, but I’ll try to keep it up and post a little piece about my current life. So I made it into the PhD course at Handai and survived the enrollment procedures, orientation and guidance etc. Everything’s going well. My prof accepted my research proposal. I registered courses (only two though, because I’m also participating in two reading/study groups) and was asked to help with two research projects. But at the same time, it began to dawn on me that if I’m supposed to finish my PhD after three years, I would start to write my dissertation after two years at the latest. Which would also mean that I have to write my preparatory thesis even earlier, which means: I… don’t… really… have… time………………. If I was going to write the thesis in the subject I’m most familiar with (Japanology), it would be doable. But I had the great and clever idea to study Clinical Philosophy here, while my philosophic knowledge is very rudimental (what kind of drugs did I take when I made that decision???). So at the moment everything feels like a mess while I need to catch up on too many things. First of all, Philosophy of course. But the real challenge is Public Health with which I’m concerned and which is connected to so many other fields that every time I get a hint for my reasearch and think that I should do a little investigation on that it opens a Pandora’s box. And this is where I return to the first problem: Three years is a hell of a short time! How am I going to finish all this in only three years? One course I registered turned out to be a kind of self-help group for desperate graduate students and there I learned that the Japanese students have the same doubts as me which felt very relieving. At least I’m not alone. When it popped out of me that I wasn’t sure whether to enter the PhD course was a good idea I was laughed at and felt a bit embarrassed. It’s a very common expression in German to say that you’re “not sure whether something was a good idea”, but I figure that my words sounded stronger in Japanese. Anyways, although I have some doubts about this PhD project I know that I would have regretted it forever if I didn’t even try. And I need challenges. I never go the easy way (though I’m not so sure whether that’s a good thing ;-p ). That’s what I’m confident in. Being in Tokyo for a day this week I used the opportunity to visit the restaurant of the Japanese scale maker Tanita which opened earlier this month. 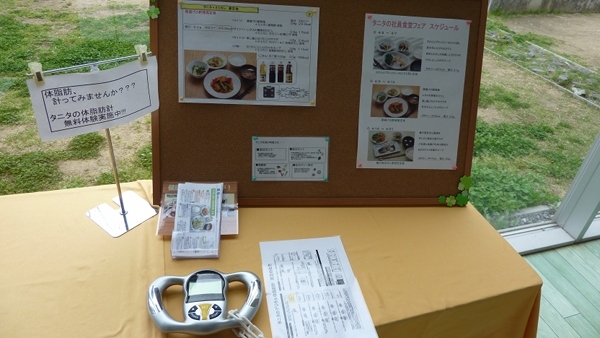 Tanita, the company which introduces itself as the one “who measures health” (「健康をはかる」タニタです）, had already published two cookbooks based on the recipes the company’s cafeteria offers its employees. All of these recipes describe set menus designed to provide around 500 kcal and hardly any salt while it is claimed they are tasty and filling. With these cookbooks Tanita tackled two problems of contemporary Japanese eating habits: Eating too much and too salty. Both books became bestsellers in no time and now it seems like Tanita hits the spot again with its restaurant based on the same principles. “Maru no uchi Tanita Shokudo” is located between Tokyo station and the imperial palace. Walking to the restaurant you pass expensive brand shops and busy salarymen. This location certainly was chosen on purpose and hints to a Japanese characteristic. 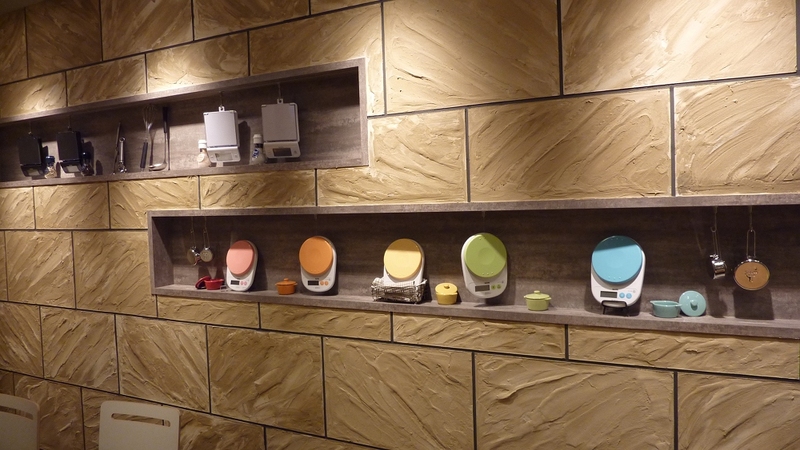 Unlike other industrialized countries, in Japan being overweight is not a problem of the poor but the wealthy so it’s no wonder that a restaurant which aims at educating people about food and maintaining a healthy weight is found in Maru no uchi. When I arrived at the restaurant at 13:30 approximately 30 people were already standing in line waiting to get in. But these weren’t people who just waited to get a place in the restaurant as I thought at first, they were some of the lucky ones who managed to get a ticket in the morning. 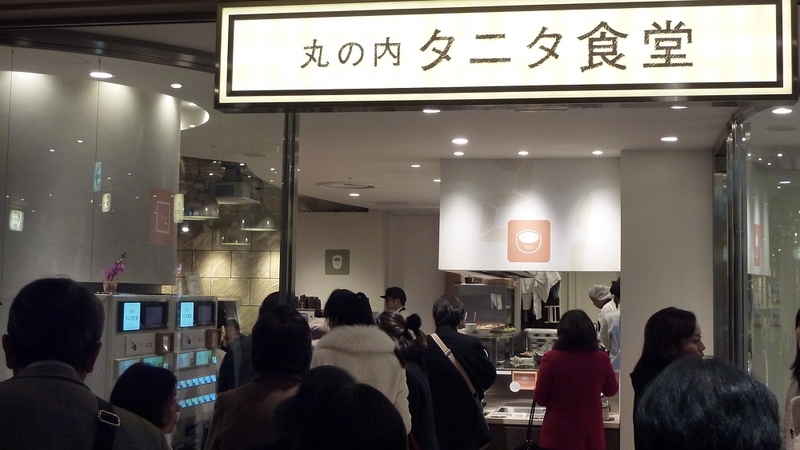 Since Tanita Shokudo opened its doors on January 11th, there’s such a rush of people, that a ticket system was introduced to reduce frustration among guests and disturbance to the neighboring restaurants. 400 Tickets are now being distributed every morning from 8:30. 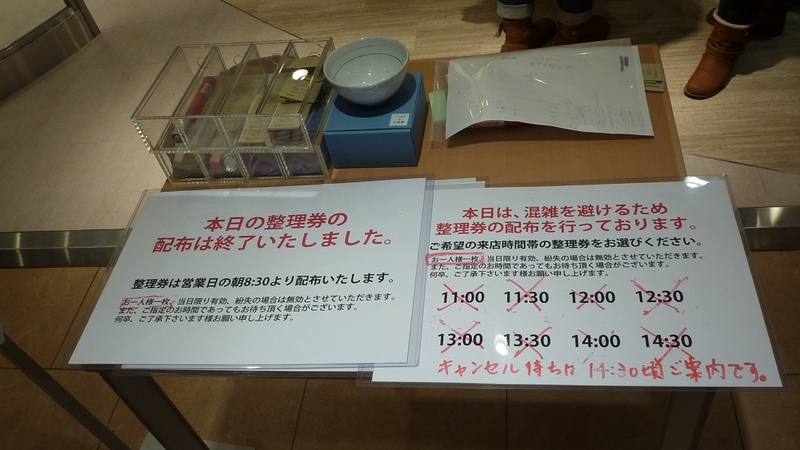 You have to choose the time you want to eat while the restaurant is operating between 11 am and 3 pm, but you have to fetch your ticket early because they are given away in no time. It’s also not possible to get more than one ticket per person. Tanita says that information on the ticket system are published on newspapers and the restaurant’s homepage, but there are still many people who come without knowing of the system and have to leave disappointedly. While I was observing the scene, there was also an elderly woman who must have stood in line for over an hour without having a ticket and had to go when she finally was about to enter the restaurant. For a last chance to enter the restaurant you have to wait at least until 14:30 when all persons with tickets have been served. If you’re lucky, some people cancelled their ticket so that a few more can come in. 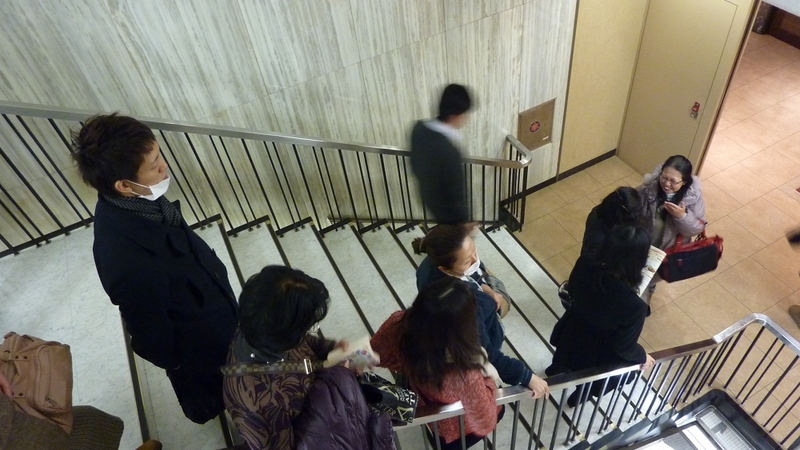 Around 2 pm the restaurant staff directed those willing to try their luck to wait on the stairs not far away from Tanita Shokudo so that they wouldn’t block the way to other restaurants. In the meanwhile, guests of the restaurant also have a chance to get a free counselling from a dietician. There were constantly four to five people waiting for their turn to get into the totally transparent consultation room. The waiting guests observed and commented on the procedure inside and since the door wasn’t even closed they must have been able to understand the conversation inside. Privacy Zero. 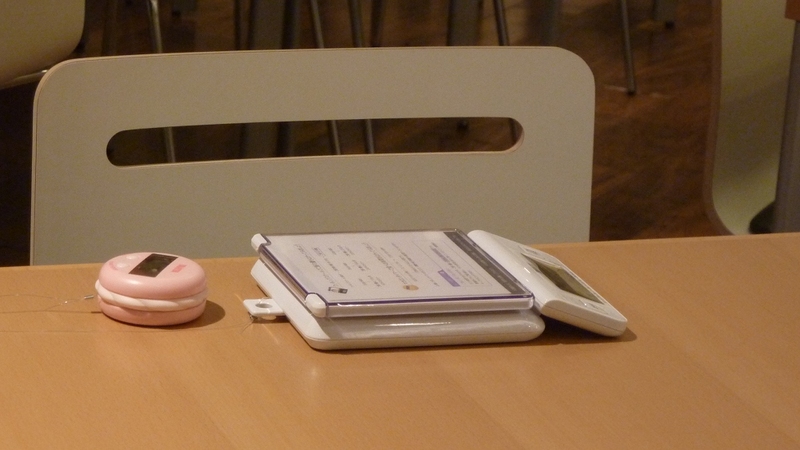 The counselling starts with measuring weight and other data of the guest by stepping on a large scale. It is connected to a printer so that the data is immediately printed and discussed afterwards. The whole procedure takes around 5 minutes. At 14:40 ten of the eighteen people waiting on the stairs are allowed to get into the restaurant, the others, including me, have to be patient a little bit longer and still don’t know whether their patience will pay off with a meal in the end. After another ten minutes the last six people are lucky and two have been waiting in vain… Being number 13 I am lucky to get in, but the usual choice between the weekly (900 Yen) and the daily (800 Yen) set menu has been reduced to the weekly only. 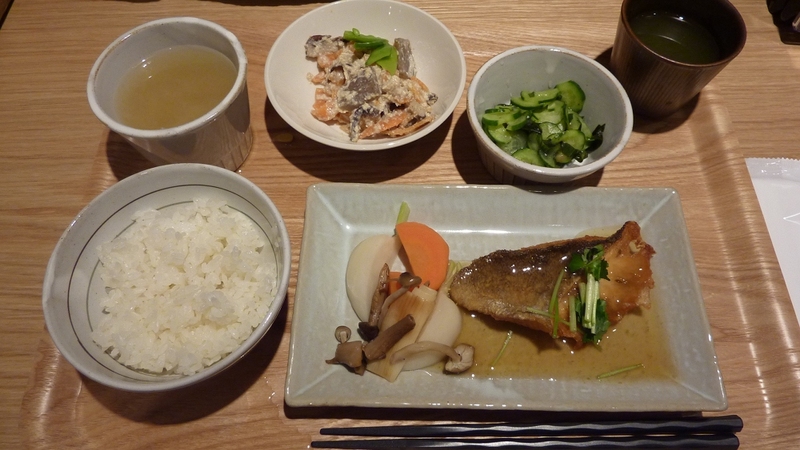 This week’s set menu consists of vegetables and fried codfish with a Japanese lemon and pepper sauce. The side dishes are the same as for the daily set menu and today consist of a dish made of carrot and konnyaku garnished with mangetouts, some cucumber and perilla mint salad and a soup containing onions and sprouts. Not to forget the white rice which you can take as much of as you like, but Tanita provides rice bowls with measuring lines that mark 100 and 150 g of rice. To make sure that your set menu doesn’t exceed 500 kcal you should take only 100 g rice. Tea is also offered and you can choose between green tea (sencha) or roasted tea (houjicha), both hot or cold. What the guy in the video uses most often to describe the taste of the food is “yasashii” which means something like gentle and nice. He states that “it doesn’t contain anything unneeded” and that the miso soup tastes normal but not salty. While I really like Japanese food I find it too salty or sweet at times and therefore was surprised at the plain taste found here at first. The only spice that seems to be used a lot is pepper. It took me 22 minutes and 21 seconds to finish everything and I was pleasantly filled afterwards. After all, eating at Maru no Uchi Tanita Shokudo is nothing for people on a tight schedule. At least not as long as you have to queue for a ticket in the morning and then queue again to get in at the time you want to eat. I wonder how long this rush on the restaurant will continue and whether the Japanese will get used to this somewhat tasteless taste. Reading the first comments on “Tabelog”, a website for restaurant reviews, most commentators agree on the weak taste and one even describes the meal as an “expensive hospital menu”. … since I wrote something on my blog. This is due to the fact that I got very busy from November last year and didn’t do much interesting stuff. On the opposite, I had to cut back on social life a lot because I expectantly had to write a quite long research proposal for the extension of my scholarship within a week. I was glad to write this paper though, because it helped me to sort out my thoughts and bring the work of half a year into an order I could work with in the future. My supervisor at Osaka was very pleased about the paper and formed a small study group together with other students who research about similar topics. Later I could also use this paper for a speech at university and when I sent it to my doctoral supervisor he was also pleased to see how I’m proceeding with my research. So I’m looking forward to getting more active again when the exam is done, but I got a feeling that if I pass, my working style will have to change a lot from April and leave me much more busy than now. でも頑張ります！I’ll keep on fighting!